The day I walk away..: ..Paper Bag.. Heee..I found you Mr Browny..Finally guys! This is exactly what I want. Simple recycle paper bag. ^_^ Ape? Kat mane saya jumpe? Hee..Mane lagi, dekat Ole-ole manis laa..The price stated there is cost about RM1.40 for this kind of size, 22cm(L)x18.5(H)x14cm(W).Ada lagi beso, tapi of course maa lagi mahal. So, I found this is the cheapest one. 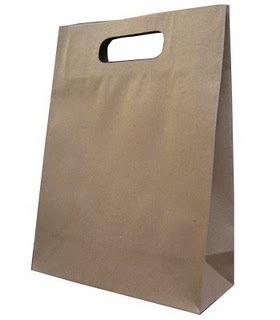 Saya tanye same cik NArdea, macam mane pulak dengan quality paper bag ni? And she said, yang jenis saya ni quality dia macam brown paper bag British India tu..